The diplomatic fracas over inviting and disinviting Iran to the Syrian peace talks only makes sense if you factor in President Obama’s fragile consensus for engaging Iran over its nuclear program – while influential neocons keep pressing for confrontation. That mix has made for a messy process on Syria, writes ex-CIA analyst Paul R. Pillar. The handling of the issue of Iranian participation in the next round of multilateral discussions on the civil war in Syria has been something of an embarrassment — certainly for the United States, the United Nations, and the conglomeration known as the Syrian opposition. The United States has seemed to be more interested in words rather than in substance in the demands it has been placing on Iran. 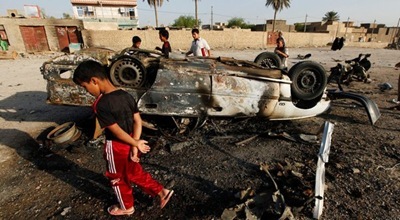 MAHMUDIYA Residents gathered at the site of one of several car bomb attacks. President Barack Obama’s announcement Friday that the remaining thirty-nine thousand troops will leave Iraq at the end of the year was largely the result of Iraq’s internal politics and a failure of U.S. policy to mend the rifts among the country’s political players. 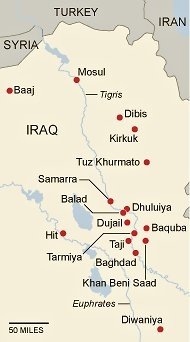 If the U.S. military were to keep three thousand to five thousand military “trainers” as planned, Iraq’s parliament would have had to grant the force immunity. Obama finally realized this was not going to happen, due to the country’s tense realities resulting from the March 2010 national election. 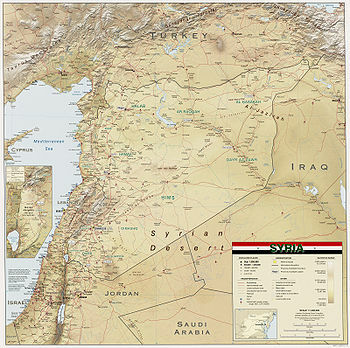 The 2010 election ended in a near draw between Nouri al-Maliki and chief rival Ayad Allawi‘s Iraqiya bloc. A political stalemate was broken through a U.S.-backed deal in which Maliki was to remain prime minister and the defense minister was to have been chosen from the Iraqiya bloc. In turn, Allawi was to have headed a new national security council body. After U.S. airstrikes killed scores of civilians in western Afghanistan this past week, White House National Security Adviser Gen. James L. Jones said the United States would continue with the airstrikes and would not tie the hands of U.S. generals fighting in Afghanistan. At the same time, U.S. Central Command chief Gen. David Petraeus has cautioned against using tactics that undermine strategic U.S. goals in Afghanistan — raising the question of what exactly are the U.S. strategic goals in Afghanistan. A debate inside the U.S. camp has emerged over this very question, the outcome of which is likely to determine the future of the region. On one side are President Barack Obama, Defense Secretary Robert Gates and a substantial amount of the U.S. Army leadership. On the other side are Petraeus — the architect of U.S. strategy in Iraq after 2006 — and his staff and supporters. An Army general — even one with four stars — is unlikely to overcome a president and a defense secretary; even the five-star Gen. Douglas MacArthur couldn’t pull that off. But the Afghan debate is important, and it provides us with a sense of future U.S. strategy in the region.